Winchester Thurston School had many things to celebrate the weekend of October 10th. Alumni returned to partake in Reunion Weekend, the inaugural class was inducted into the new Athletics Hall of Fame, and they dedicated the wonderfully renovated Athletics Wing. The first event of the weekend was the Athletics Hall of Fame induction ceremony, which took place on Friday morning. The event required seating for 600 guests, including WT students, faculty, alumni, parents, and special guests. Learn more about the inductees and watch a video about the Athletics Hall of Fame on the WT website. PartySavvy planned and prepared the tent and seating, setting up the 40’ x 120’ NaviTrac frame tent in the faculty parking lot. The tent also featured two 9’x10′ entrance canopies, and a 9’x20′ walkway canopy between the tent and the WT building. 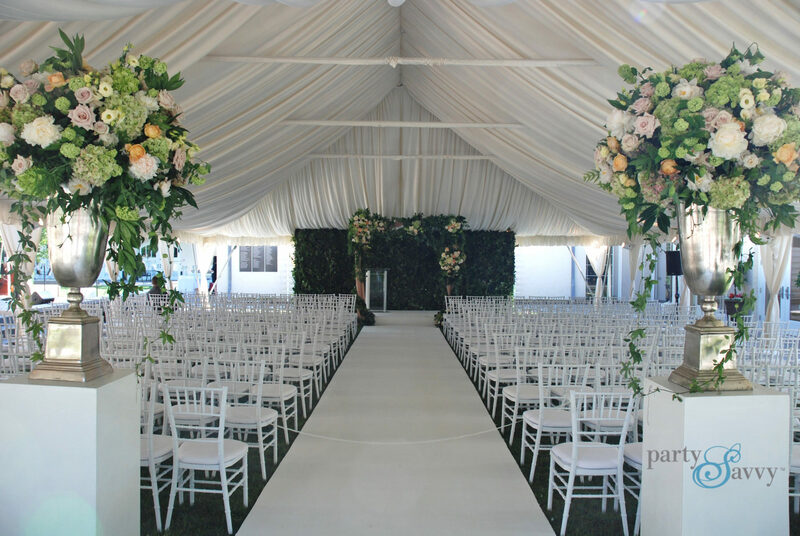 All of the tenting was enclosed with sidewalls to keep the guests comfortable and safe from the elements. The tent and walkway canopies were also heated and lighted. Since stakes could not be driven into the parking lot to secure the tents, all of the tenting was anchored with water barrels. PartySavvy also provided a stage for the speakers, and sub-contracted the sound services to an Audio Visual specialist. The crew set up 610 white garden chairs, meticulously measured for perfectly aligned theater-style rows. PartySavvy had a staff person on site during the ceremony, and the AV company provided a sound technician to ensure the audio worked smoothly for the entire event. Following the Friday morning ceremony, the PartySavvy crew returned to break down all of the chairs and the staging, and set up for a Friday evening cocktail reception. Early Saturday morning, the crew returned once again to break down everything from the cocktail reception and re-set the tent for a luncheon on Saturday. PartySavvy provided all of the planning, equipment (tents, heat, light, staging, chairs, tables, and linens), and labor for each of the three events. CAD drawings were prepared and approved in advance for each event, which meant that no member of the Winchester Thurston School staff needed to supervise the set up of any of the events. Below, you can view copies of each of the CAD drawings for the three events we produced. This is a service we provide at no charge to our clients. The CAD drawings eliminate any guesswork when it comes to planning an event, ensuring the layout flows well and guests can move comfortably throughout the space. All three of the events were executed to perfection by the PartySavvy staff, and the client was very pleased with the quality of our products, and with our services. Browse the CAD drawings and photos of the event in our gallery below.